Summer isn't summer without popsicles! When I found this product I fell in love. Who doesn't love making popsicles? In the comfort of their own home? With fresh ingredients? in under 7-9 minutes? I love the idea of quick & easy, which is what the Zoku exemplifies! It's a DIY popsicle maker! I bought the Zoku along with the additional accessories as an all inclusive package. This package included the Triple Quick Pop Maker, a Storage Case, a Tool Kit and a Quick Pops Recipe Book. The additional tools in the tool kit included 3 measuring/pour cups, a star and heart fruit stencil, a fruit wand, a turkey baster, and lastly an angle tray! Prior to making your popsicles you need to freeze the Quick Pop Maker unit for at least 24 hours before your first use! After you freeze it you can use it at intervals of 45 minutes at a time before it requires refreezing! (Which means you can make up to 9 popsicles in this time!) What I loved most about this popsicle maker was that there was NO CLEAN UP! You put in your liquid, let it freeze in the unit (on your counter! ), take the popsicle out, eat it and that is it! There is no need to wash your Pop Maker, at all! Now, that sounds so good to me! Doesn't it? Eat and relax? YES! What really surprised me was that you didn't need to put the popsicle into the freezer! You can literally watch the process of how your popsicle freezes as the unit helps flash freeze your liquid to a solid! Since the unit flash freezes your liquid you could imagine that if you were to put your finger inside the popsicle slots that it would be very similar to you putting your tongue on a frozen pole in the winter! It freezes instantly! Now, with your liquid flash frozen to all sides of the unit, there is an included remover tool that helps you remove your popsicle without having to pull and tug so hard! The remover uses the force of torque to help remove your frozen treat! You must be wondering what causes the flash freezing! Well... the Quick Pop Maker is completely safe, and non toxic as it is filled with a saline solution and thats it! I have not encountered any problems with the Quick Pop Maker so far, which is good! I absolutely love how I can incorporate fruit (with my fruit wand) in my popsicle without it being a mess. I also love how I can make a whole variety of popsicles that vary from being healthy, to looking really cool, or just tasting super yummy! YES! I would even recommend it to my friends and family to purchase! It is a great way to have a quick dessert without giving in to those unhealthy popsicles which are made out of who knows what! 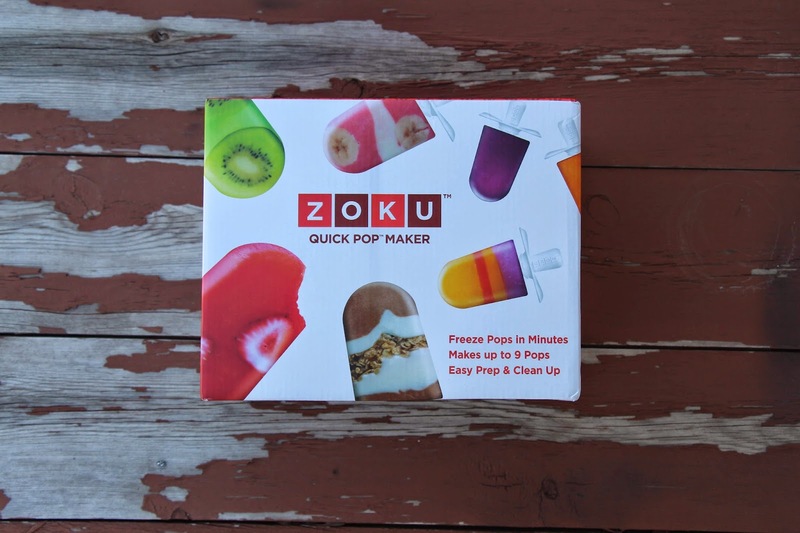 Would you guys like to see how I make a popsicle using the Zoku? Are there any recipes you would like me to share with you? Let me know in the comments or tweet me!